Nelma was born in Naicam, SK on February 5, 1924 to parents August and Annie Pederson. She married Otto Hagen on July 28, 1942. Nelma worked as a house keeper for various people in the area and helped on the farm hauling grain and working in the fields. She enjoyed cooking and in her younger years she taught her daughter, daughters-in-law and granddaughter to make lefsa. Nelma moved off the farm to Hillcrest Court in Naicam in 1996, to Caskey Place in Melfort in 1999 and to Chateau Providence in St. Brieux in 2018. Nelma was predeceased by her husband Otto in 1994, daughter-in-law Dariene, parents August and Annie, brothers Edward in infancy, Orvil, Albert, Rudolf and Elmer and sisters Evelyn Bonderud and Ordella French. 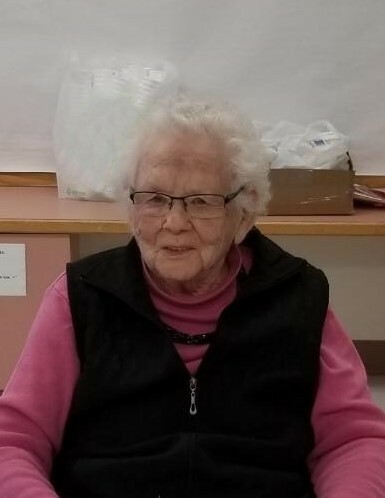 She leaves to mourn her passing her sister Lydia Williams, daughter Anne (Doug) Hartley and three sons Arnie (Bernadette), Ken (Debbie) and Lyle (Delores) Hagen and numerous grandchildren and great grandchildren.